Lawn fertilizer isn’t exactly the sexiest product category out there, but its proper use can have huge effects on our environment. Ketchum Public Relations on behalf of the Fertilizer Canada needed an approach for a public information campaign to help the average home owner understand and remember the correct use of lawn fertilizer. 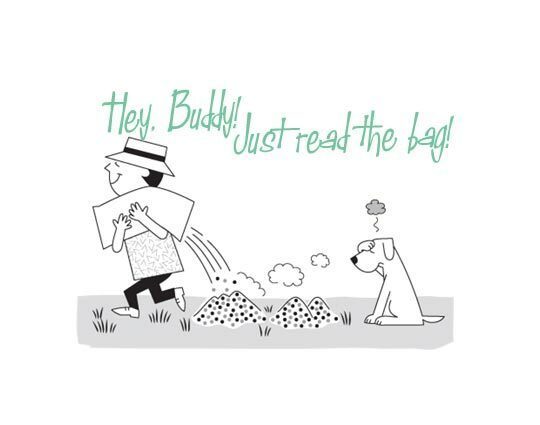 Fertilizer’s proper use isn’t especially complex and instructions are printed on every bag sold. The improper use has had noticeable impacts on water systems and the environment. How to get this pretty dry info across in a light, fun way without breaking the bank? So we created two characters – the oft confused “Buddy” and his much smarter dog, “Terra” and wrapped it all up with 50’s inspired line art style. Together they explore the key points of proper fertilizer use while providing a smile along the way. Using illustrated characters, as opposed to models and photography, allows them to get into any situation without requiring a full out photo shoot.